As Homer Simpson would say: "It's funny 'cause it's true." And for two reasons. First, and most obviously, because statistics can be confusing and second because the industry's statistical definition of risk is too academic and doesn't get at the root of what keeps investors up at night. Finance textbooks and trading models might define risk in statistical terms based on volatility, but such definitions are incomplete for patient, business-focused investors. Instead, what long term investors are really concerned about is permanent loss of capital. As the name implies, a permanent loss of capital differs from a temporary loss of capital that's due to market volatility and it occurs when an investment's value has declined so much that getting back to break-even within a few years is unlikely. Effectively, an unrecoverable loss. 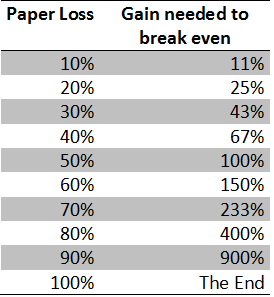 To put this in some perspective, consider a 50% paper loss on an investment. While it's certainly possible for the stock to stage a huge recovery and double in value over the next year, if we assume historical equity returns of 9% per year, it would take about eight years for the stock to get back to even on a nominal basis. Though you might patiently wait for this to happen, that investment from eight years prior was in essence wasted capital that could have been invested more effectively elsewhere. Invest long enough and you'll have a permanent loss of capital at some point. It's bound to happen as we're all human, but it's critical to make large losses infrequent events as they can seriously weigh on your portfolio's long-term returns. 1. Buy with an appropriate margin of safety. This may seem obvious -- buy a stock for less than it's worth and you'll reduce the odds of permanent losses -- but (a) we as investors are prone to buying into stories, individual attributes (high yields, low PE, etc. ), or a hot tip and fully disregarding valuation and (b) when we do adequate valuation work we often make inappropriate margin of safety assessments before buying. What I mean by the latter point is that we should demand a larger margin of safety when buying a business with a higher degree of uncertainty and vice versa. It's one thing to buy a large cap defensive company like Coca-Cola with a 10% discount to fair value, but a 10% margin of safety isn't likely enough for a small-cap stock in a cyclical industry. You're more likely to lose your shirt feeling too confident in your assessment of the small-cap's value than you are of Coca-Cola, so a larger margin of safety is required. 2. Use a checklist. Online investing and low-commissions, as great as they are, also cater to impulsive decision-making. It's easy to read a few company filings, get excited about what you're reading, and press the buy button. As a check on your emotions, make use of an investing checklist (like this one) before placing a trade. If the latest idea doesn't check off all the boxes on your list, figure out why that's the case. There could be a good explanation, but if there's not, consider passing on the idea for now. The important point here is that checklists can save us from making stupid decisions based on emotion. For more checklist ideas, +Stockopedia has a great set of checklists based on different styles of investing. 3. Ask the right questions. Before buying a stock, fully consider alternative theses and perhaps more importantly what other bulls are thinking, as this can save you from missing giant red flags and blindly following the herd. In other words, we need to ask different questions than our fellow market participants if we aim to make good investments and avoid permanent losses of capital. First-level thinking says, "It's a good company; let's buy the stock." Second-level thinking says, "It's a good company, but everyone thinks it's a great company, and it's not. So the stock's overrated and overpriced; let's sell." Each investment will have specific questions to ask, but if you're looking for a good place to start, here's my list of five questions to ask before buying a stock. 4. Focus on trends in competitive advantages. The market has become incredibly focused on the short-term. For example, the average stock mutual fund turnover rate have jumped from an average of 17% between 1945 and 1965 (implying an average holding period of about five years) closer to 100% today (implying an average holding period of about one year). Naturally, then, market participants seek short-term information advantages -- e.g. "Will this company beat next quarter's consensus estimates?" -- at the expense of gathering helpful long-term information. My fear is that much of what passes as incremental information adds little or no value, because investors don't properly weight information, rely on unsound samples, and fail to recognize what the market already knows. In contrast, I find that thoughtful discussions about a firm's or an industry's medium- to long-term competitive outlook are extremely rare. Spend more time in your research process thinking about where this company might be three- to five-years from now. A simple way to get started is with a "SWOT" analysis -- listing the company's strengths, weaknesses, opportunities, and threats. Then ask how the company might enhance its current strengths, reduce its weaknesses, capitalize on opportunities, and respond to competitive threats. 5. Avoid cult stocks & sectors that are in the market spotlight. Jason Zweig had a great post for the WSJ this week on his mission to save investors from themselves by helping them avoid speculative periods in the market. Also the commentator on the revised edition of Benjamin Graham's Intelligent Investor, Zweig has the rare ability to spot market irrationality and stand behind his convictions even when they're not popular at the time. Bingo. Can't say it any better than that. Consistently follow this advice and it will help you avoid permanent losses of capital. The best definition of risk for long-term investors isn't volatility, but permanent loss of capital. Every investor will have permanent losses over his or her investing career, but the key is to minimize their frequency. Hopefully these five suggestions will help you avoid some of them. This week's market dip got me thinking about the right temperament -- that is, the proper mental approach -- for buying stocks at various points in the market cycle. We've already established some strategies for selling stocks that are consistent with a patient, long-term strategy, but what about strategies for buying stocks? In my experience, having the right buying temperament is just as important as your research and valuation process. If you aggressively bought stocks in early 2009, convinced that the market's pessimism was near its nadir, that action likely mattered more than any DCF models you built at the time. Conversely, an expertly-researched investment made in late 2007 near the last market high may still be underperforming your expectations. I don't mean to diminish the importance of doing your homework, but only to illustrate how critical temperament is in the buying process. Though patience is the best default approach to buying, there are points in the market cycle where it pays to be more aggressive. If one is cautious and patient in his method of proceeding and the times lend themselves to this kind of policy, he will prosper. But if the times and circumstances change, he will fail, for he will not alter his policy. At this stage in the market, investors are becoming increasingly optimistic about stocks, so it's important to be on guard when buying. Good long-term buying opportunities can certainly exist at this point in the cycle (especially early on), but before buying ask yourself how much of the optimism is already priced-in. As a side note: when building forecasts in a rising market, beware of recency bias and avoid projecting continued above-average margins unless you have good reason to do so. This will inflate your fair value estimate and might encourage you to buy when it is not prudent. Instead, use normalized margins -- an industry average, a trailing five year average for the company, etc. -- as reversion to the mean will eventually occur. Investors have begun to sell stocks for any number of reasons and enthusiasm for equities has turned into skepticism. Armed with a good watchlist and spare cash, patient investors with a long-term perspective will find buying opportunities when short-term minded investors are selling. Even though better buying opportunities are presenting themselves at this stage in the market, it's still important to be selective. After all, investors could be selling a particular stock for a good reason. As such, have a thesis about why investors are selling and why your approach is better. In late February 2009, I distinctly remember grabbing a coffee with an investing partner and remarking that the market pessimism was almost palpable. All the news stories seemed to be about rampant foreclosures, stocks being dead, the coming dominance of gold, the end of fiat currency, etc. Anyone on live television with a positive or optimistic thing to say about the markets was ridiculed. That was the time to be a bold buyer of stocks -- "the point of maximum pessimism" to borrow a phrase from Templeton. Here action is paramount and it's the ideal time to buy the stocks on your watchlist and perhaps a few others. Of course being a buyer at this point is easier said than done. It's psychologically very difficult to do and you're often in "preservation of capital mode". If you have the means and fortitude to be a buyer, however, there's no better time to put money to work in the market. As you consider the three phases of buying temperament, don't think of them as three distinct phases -- rather, that they flow into one another. At the market peak, caution is paramount, but as the market falls, the time for being cautious subsides and the time for being opportunistic grows. And so on. The important thing to remember is that your approach to buying should be the inverse of the market's overall emotions at a given point in the cycle. If you can consistently practice this along with doing solid research, your long-term returns should be very satisfying. The DIY Income Investor's "Evolving Strategy"
Monevator's "How to Spot a Bull Market Top"
Can a Total Shareholder Yield ETF Work? A rare mid-week post, but earlier today I read an interesting article on Forbes about the Cambria Shareholder Yield ETF (SYLD), which was based on an interview with the Cambria CIO. So I decided to dig into the story a little this evening. The Cambria Shareholder Yield ETF is an actively managed fund that employs the manager's quantitative algorithm to select U.S. listed companies that show strong characteristics in returning free cash flow to their shareholders. Specifically, SYLD invests in 100 stocks with market caps greater than $200 million that rank among the highest in (a) paying cash dividends, (b) engaging in net share repurchases, and (c) paying down debt on their balance sheets. Though I give Cambria credit for trying something different, after reading the SYLD ETF's prospectus, I'm not sure it will work as an ETF or formula-based strategy. 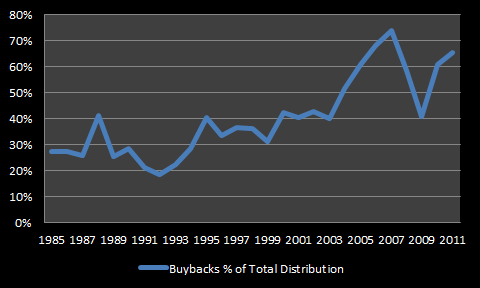 As we discussed in an earlier post, though buybacks are becoming a larger part of corporate distributions, I don't think a "total yield" measure can replace dividend yield. To Cambria's credit, they are looking to invest in companies with a systematic approach to buybacks, but this puts enormous faith in management's ability to have a good buyback process. How Cambria measures this in its security selection algorithm is not disclosed, but it seems to be a challenging task using a strictly quantitative process. As we've seen, many companies end up buying back stock when they have excess cash...which also tends to be when their share price is higher. In my experience, I've come across very few companies with a rational and disciplined approach to buybacks. I'm also not clear on why debt reduction should be considered part of "shareholder yield." At face value, less debt on a balance sheet seems desirable, but it's also possible for companies to be underlevered. In this case, companies should take on more debt to reduce their overall cost of capital. Further, and more to the point, the cash return is to bondholders and not shareholders. If I were considering SYLD I would ask whether or not net debt reduction was simply a "plug" figure in the formula that made the algorithm look more predictive than dividends and net buybacks alone. Best case is the ETF is looking for firms that can return cash via dividends and buybacks without borrowing, but if that's the case, it should be more explicit in the prospectus. I realize I've been critical of most of the new ETFs out there, but I also think it's important to look behind the alluring stories in the ETF launch material. Ultimately, I remain convinced that investors are best served building their own dividend-focused portfolio one stock at a time with thorough research. I'm interested to hear what you think, so please let me know in the comments below or on Twitter @toddwenning. Each week it seems a new dividend ETF strategy comes across my Twitter feed. I'm not surprised, of course -- the financial sector will always be quick to strike when the iron's hot -- but it bears repeating that investors should be careful before buying a dividend ETF. But why is that? One reason is that the strategies of many new dividend ETFs rest on newly-minted indexes based primarily on backtested data. Invariably they show how the strategy has outperformed a peer group in the past, but continued outperformance is far from assured. 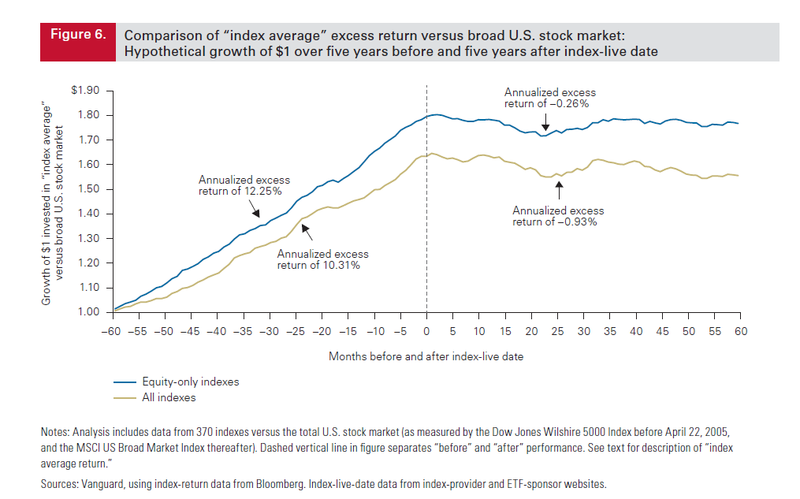 "The index average for all the indexes outperformed the broad stock market at an annualized rate of 10.31% as measured by five years of back-filled data, but underperformed at an annualized rate of –0.93% over the five years following the index live date." Even more concerning is that the median time between index creation and ETF launch was just 77 days (down from 3 years in 2000). Two and a half months hardly seems enough time to ensure an index truly reflects the strategy it is meant to track. The problem for the ETF industry is that it takes about five years for a strategy to show whether or not it is truly effective. Thankfully for them, backtesting is a quick and simple marketing salve. I've been skeptical of dividend-themed ETFs (and ETNs) that are based on backtested strategies for a number of years now. Some are better than others, but there are four key reasons to approach them with caution. 1. Piling on. If a backtested strategy is indeed profitable and its creators are confident in its ability to outperform in the future, you'd think they'd want to keep it to themselves, right? Once a worthy strategy is shared with a larger audience, however, investors naturally pile on and what alpha there might have been will dissipate -- especially if the strategy is easily replicated. As such, it's critical to ask yourself the following: "Why is this strategy being sold to me? And if it's so great, why aren't they keeping it to themselves?" If you can't answer those questions, look elsewhere. 2. Selling history. Past performance is not a guarantee of future returns. Reversion to the mean is a part of investing and what's worked in recent years stands a strong chance of underperforming in the next few years, and vice versa. Few ETF marketing departments will find it easy to sell a strategy that's underperformed even if it is primed to do well in the future. 3. Dynamic markets. One of the ways to learn chess is to start with end-games and work in reverse. The reason this is possible is that the rules of chess and the chessboard are static. The market is much more dynamic and investing environments change over time, making forward-looking strategies based on historical strategies all the more unreliable. Case in point is the performance of some WisdomTree's dividend ETFs during the financial crisis. Their strategies were backtested with forty years of data (1964 to 2005) -- a fair amount of data -- but that period of time didn't encounter anything like we saw in 2008 and 2009. WisdomTree's dividend-weighted strategy simply didn't work the way it was intended when hundreds of stocks cut their dividend payouts. 4. Shoddy statistics. Lazy statistical research can lead to false (and dangerous) conclusions. Most of the backtested index presentations that I've seen are missing critical pieces of information that allow the investor to independently determine whether or not the results are statistically significant (ANOVA tables, etc.). If this type of information is not available, it's cause for concern. Dividend ETFs with exciting strategies supported by backtested data seem a quick and easy way to get exposure to dividend stocks, but be careful not to buy into a strategy that may have already passed its "sell by" date or one that heavily depends on a certain type of market environment to prosper. Ultimately, I believe investors are better served by methodically and patiently building their own dividend portfolio rather than buying a dividend ETF. To get started, here are my five keys for building a dividend portfolio and Dividend Compass tool to help you identify stocks with sustainable dividend payouts. Any questions or comments? Please post them below. Stay patient out there and have a great weekend!